MOULTRIE, GA – Hay and baleage producers in the Southeast could earn major prizes in this year’s Southeastern Hay Contest at the Sunbelt Ag Expo. The 2015 SE Hay Contest is presented by Massey Ferguson. 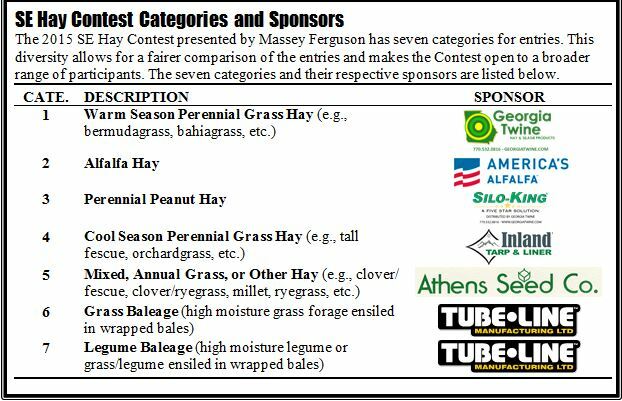 As a result of Massey Ferguson’s sponsorship and major support from sponsors for each of the seven categories in the SE Hay Contest, category winners can win cash and, in some cases, free use of Massey Ferguson hay equipment. Massey Ferguson has joined the effort by being the title sponsor for the SE Hay Contest. They will be providing the Grand Prize of a new Massey Ferguson RK Series rotary rake for the 2016 hay production season and a $1000 cash prize. Additionally, Massey Ferguson will be providing the winner of 1st Prize in the Warm Season Perennial Grass Category with the use of a new DM Series Professional disc mower for the 2016 hay production season. Each of the 7 categories has been sponsored by additional industry partners (see inset titled “SE Hay Contest Categories and Sponsors”). These sponsorships will provide cash awards to the top 3 places in each category, including $125 for 1st prize, $75 for 2nd prize, and $50 for 3rd prize. Dr. Hancock encourages producers from all 13 southeastern states to check out the rules and entry forms and enter today. The deadline for entry into the SE Hay Contest is 5 p.m. on Monday, September 28, 2015. More information about the Contest, including the rules and entry forms, is available at bit.ly/SEHayContest2015. 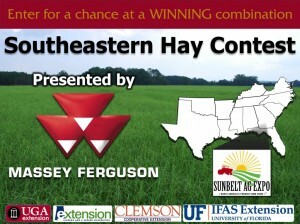 Also follow the Southeastern Hay Contest on Twitter (@SEHayContest) and Facebook (www.facebook.com/SEHayContest) for periodic articles, updates, and timely information on producing high quality hay and baleage.